Beat eggs with pepper, oregano or basil, and cheese in a medium bowl. Heat oil in a medium skillet. Add onions, garlic, and other vegetables and cook on medium (300 degrees in an electric skillet) until soft. Pour egg mixture over vegetables. 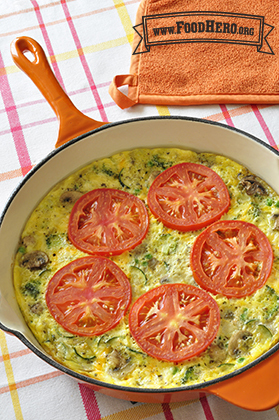 With knife or spatula, lift outer edges of eggs so egg mixture flows to the bottom of the pan. Cook until eggs are set, about 6 minutes. Top with tomato slices. Cut into 8 wedges; serve hot.